A fabulous, pocket-sized guide to flowers, trees, birds and insects. Beautiful illustrations and descriptions of over 500 different species. Includes pages of wildlife information and identification tips, tick boxes and spotter's scorecards. Links to websites with online guides and activities via the Usborne Quicklinks Website. 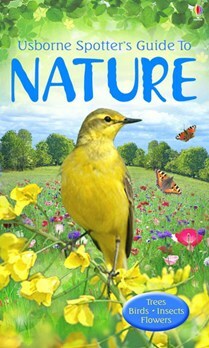 This book contains the following Usborne Spotter's Guides titles: Trees, Birds, Bugs and Insects and Wild Flowers. A fabulous pocket-sized guide to flowers, trees, birds and insects. It has beautiful illustrations and descriptions of over 500 different species, includes wildlife information and identification tips, tick boxes and spotter’s scorecards as well as links to websites with online guides and activities via the Usborne Quicklinks Website.